At my Chicago dental office, we usually recommend that our patients visit us at least two times a year for a dental checkup and cleaning. While most of our patients maintain these very important appointments, there’s a country-wide trend where men don’t see their dentist regularly and only go when there’s a problem. What these men may not know is that preventive dental care can actually keep those bigger problems away. Checkups and cleanings are used to catch any potential issues before they become larger and require more in depth treatment. 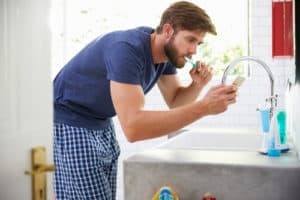 But by skipping regular visits to their Chicago dentist, men are at increased risk for some serious and dangerous oral health problems. Higher Rate of Gum Disease. According to the American Dental Association (ADA), 34% of men ages 30-54 have gum disease compared to 23% of women in the same age range. Gum disease is actually more than just an oral health concern. If left untreated, it may lead to other whole-body problems like heart disease, certain types of cancer, and respiratory disease. Greater Need for Advanced Dental Care. When the mouth is neglected and problems are left to fester over time, the likelihood for advanced treatment increases. High levels of decay could warrant a root canal and dental crown, or if really advanced, loss of teeth. When teeth are lost or extracted, they need to be replaced with either a dental bridge, dentures, or dental implants. Double the Risk for Oral Cancer. Men are at twice the risk of developing oral cancer than women. This may be in part because men use tobacco more than women. When caught early, oral cancer can usually be treated successfully. However, if regular dental appointments aren’t kept, there’s a good chance the cancer won’t be caught in the early stages. When left untreated, oral cancer can spread and cause pain, the need for surgery, and even death. Whatever the reason may be that men aren’t going to the dentist, the fact remains that regular dental care is important for everyone, including men. Not only does prevention help keep smiles healthy, they can help keep the whole body healthy too. If it’s been awhile since you’ve seen a dentist, give my Chicago dental office a call to schedule an appointment.